An engraving depicts slaves picking cotton from the fields of a plantation. Editor's note: Edward E. Baptist, an associate professor of history at Cornell University, is the author of "The Half Has Never Been Told: Slavery and the Making of American Capitalism," published by Basic Books. The opinions expressed in this commentary are his. (CNN) -- One day two lifetimes ago, about 1825, a man from Maryland was standing outside a Methodist church after service, talking with his friends and fellow church members. William was enslaved. Parts of his life were very difficult. But he had also been able to create richness in other parts of his life. He probably had a family, and he was very active in the church. Yet as I explain in my new book "The Half Has Never Been Told," on that particular day everything suddenly changed for William. William saw his owner approaching him with another white man. William might have never met this man before, but he had heard all about him. This was Austin Woolfolk, a slave trader who shipped hundreds of men, women, and children from Maryland down to New Orleans every year. And Woolfolk was carrying rope. Woolfolk told William to stretch out his hands. William had been sold. He would be shipped or marched down to New Orleans, where Woolfolk would sell him again, probably to a cotton planter. In Louisiana, or Mississippi, or Alabama, he'd have to learn a different kind of work, and build a new life -- if he survived the diseases and violence that shortened African-American lifespans in the cotton regions. Now his friends began to break down, weeping and screaming like people at a young person's funeral. They were watching yet another friend's life dissolve in front of their eyes. Starting in the 1790s, slave owners began creating a huge cotton and slavery complex on the newest frontiers of the young United States. Cotton soon became the world's most important market commodity -- the Big Oil of the 19th century -- and the work of slaves like William was driving the industrial revolution. We live today in an economy built in part on the foundations that people like William laid. That's what my book argues, and that's why I wasn't surprised that the British magazine The Economist wasn't happy with my book. The story of how slavery's expansion helped to shape the economy in which we all live isn't likely to please everybody at a publication that spends a lot of pages explaining why our current neoliberal economic order is the best possible one. But I was surprised by how old-fashioned the response was. It complained that in a book about the exploitation of the enslaved, slave owners came across as exploiters. It complained that in a book about the violent things done to people like William -- and how people like William survived -- the enslaved were "victims." Hundreds of Internet commenters reacted to the review with fury. They pointed out the casual racism seemingly implied by the flippant caption under the picture of Oscar-winning actress Lupita Nyong'o -- "A valuable property." They mocked the reviewer for claiming that slaveholders would treat their slaves well. Some of the best parodies of the review -- which seemed to be complaining that I left out the less negative side of a profoundly evil system -- were collected on Twitter under the hashtag #economistbookreviews. Even today, the discrepancy between the descendants of the enslaved and white Americans is huge ... in terms of family wealth. Bombarded by virtually unanimous disdain, The Economist quickly withdrew the review and offered an apology. Back in 1825, however, William could see no way out of his quandary. As Woolfolk tied his hands in an expert set of knots, William told his wailing, devastated friends, "Don't cry for me," for he believed that "God is everywhere!" Yet even if he hoped he could commune with them in prayer across the miles, William was not going to be able to tell his Maryland family about how he was doing. If he remarried after forced separation from his wife and children, he might raise more sons and daughters. But those children would never meet their family back in Maryland. Because of decisions by white people like William's owner, today millions of African-Americans in Maryland or Virginia don't know their millions of Mississippi or Louisiana cousins, and vice versa. But the loss goes beyond the fact that family reunions are smaller than they should be. Slavery systematically exploited, brutalized, and impoverished some people. 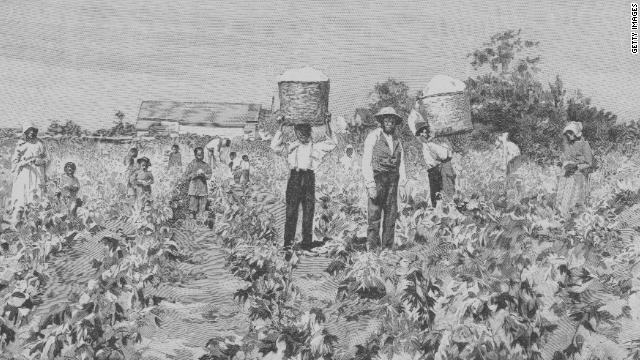 The forced movement of people to the cotton frontier made others wealthy, and not just enslavers. Northerners and Europeans created a worldwide textile industry based on slave-made cotton. They lent money to slave owners to buy more Williams from more Woolfolks and took the profit. Even today, the discrepancy between the descendants of the enslaved and white Americans is huge: In terms of family wealth, white households have almost $15 for every dollar held by African-American ones. The justifications enslavers and their allies offered for what they were doing -- claims that African-Americans were subhuman, that they were lazy, or that they were violent and needed to be "controlled" to prevent black men from rampant anti-white violence -- are still being tossed around in our society. These kinds of racism are sometimes used to justify exclusions that make it harder for black families to close that wealth gap. Sometimes they are used to justify shooting even unarmed African-Americans. And that points to another important reason to understand slavery's legacy. Facing up to the history of what happened to William, and millions of other people, would help us all -- maybe even reviewers at the Economist -- to take seriously the possibility that slavery's legacy is still destroying lives.